I mentioned that I received one of my two new oracle decks. Your Sacred Wealth Code Oracle Cards by Prema Lee Gurrer. BE SURE TO READ TO THE END FOR MY SPECIAL OFFER, GOOD THROUGH JUNE! A LAST MINUTE INSPIRATION! 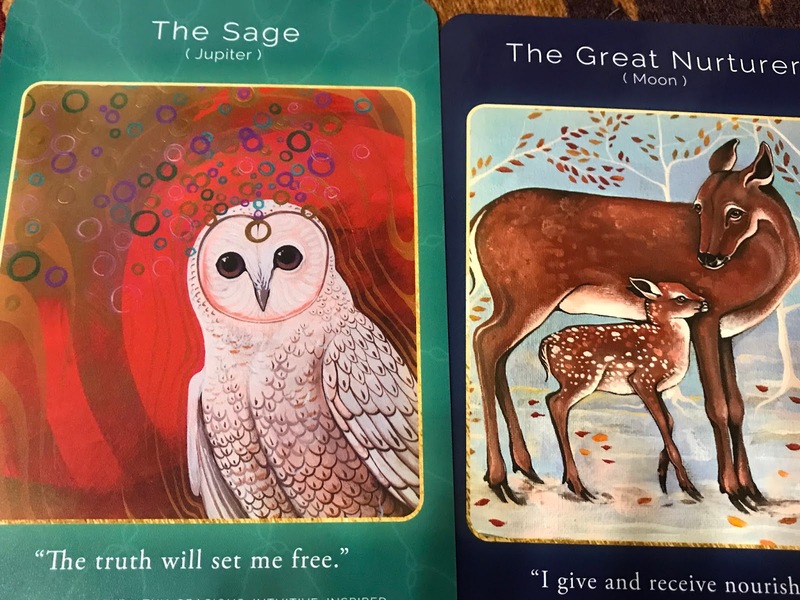 Upon opening and clearing the deck, I focused on pulling whichever cards would best reflect my main gifts that I am here to share as part of my Divine Purpose ~ and path to prosperity. We can always so easily see in others what we can not always see in ourselves! I kind of laughed when I saw The Celebrity, but upon reading it, it made perfect sense. Interestingly, I pulled both the Sun (The Celebrity) and the Moon (The Great Nurturer) and Jupiter. I have a wooden plaque hanging above the door to our bedroom area. 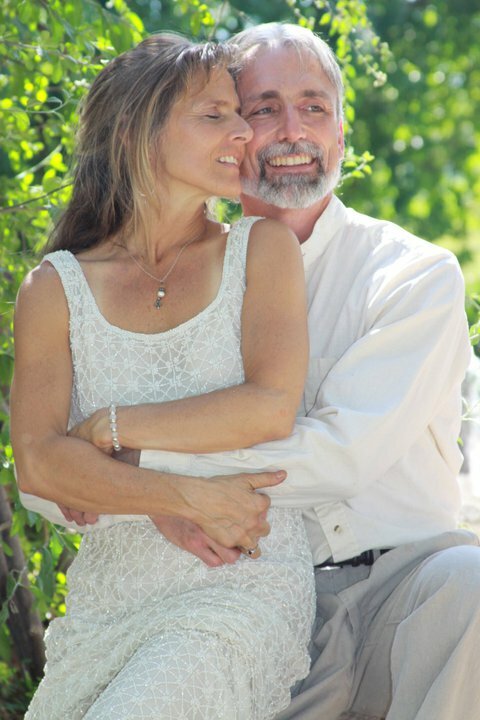 A childhood friend who attended our wedding kept looking at that plaque, and looking at our wedding photo, finally jumping when she realized one of our wedding photos resembled the wooden sun and moon carving. The moon is a crescent moon with one eye, joined with and facing the sun, with both eyes facing forward. I also have a fire sun sign, and water moon sign. A moon in Cancer is said to be exalted, as Cancer is the natural home of the moon. The moon represents our inner selves. A cancer moon person is typically a naturally nurturing sort. They can be more home body, and are often highly intuitive. 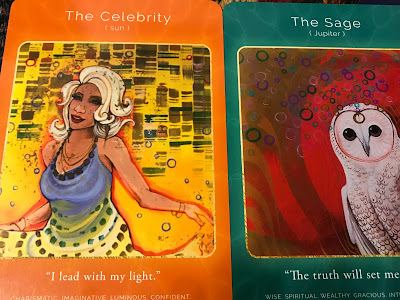 Your Sacred Wealth Code cards are archetypes that represent the many gifts we are here to express, where as she says, our passions cross paths with our purpose. The guide book explains the strengths of one with (or working with) the individual archetypes, along with the potential challenges when out of balance. We can easily swing between both. Mantra: "I lead with my light." Soul Desire: To use the power of radiance to lead and uplift others. Purpose: To uniquely shine my light to lead a successful mission and movement in the world. Shadow: Over-dramatic. Drama Queen. Self-Centered. Egocentric. Mantra: "I give and I receive nourishment." ~ To me, the Archetypal expression of the Divine Feminine, in a nut shell! Soul Desire: To be a channel for unconditional love, abundance, and growth. ~ Pretty much been my life's mission to realize this for myself. What we most needed to learn is what we can best teach. Purpose: To nurture growth, and create community. ~ Yep. That feels spot on. Also adding to help restore harmony, and inspire strength and appreciation for beauty, especially of the natural world. Shadow: Over-giving. Martyrdom. Over-emotional. Over-attached. ~ Yep again. Definitely been my life lessons. The Holistic C.O.R.E. Counseling and energy healing work have been my greatest tools for transformation, letting go, re-learning how to trust myself, express my Truth, and reclaim my True Power. While sitting at Echo Coffee House on Saturday, I consulted the guidebook after asking for the exact best archetype for Don. I didn't have the actual cards with me. I just got silent, mentally stated my intention, then randomly opened the book. It opened to The Messenger, which for him made perfect sense, especially in light of the conversation we were having. Nobody knows more than me, except for my own Higher/Divine Spiritual Source just how much these resonated with me, and my life's journey. Excited to work more with these Sacred Wealth Code Oracle Cards! For those interested in receiving a reading, you can read more about what is entailed on my website, here, here, here, and here. Mantra: "I bring the light of awareness." Soul Desire: To be an interpreter of the divine mind. Purpose: To translate and deliver news and truths which wake others up to new perceptions and a higher level of being. Shadow: Scattered. Selfish. Fickle. Uncommitted. Confused. "The Messenger is a perceptive, intelligent interpreter who delivers the truth or news that others most need to hear." Yes, that's my hubby, Coach Don. A match made in twin flame heave. I think Your Sacred Wealth Code Oracle cards will be a great addition to my collection ~ for my own daily or weekly ongoing use, and for assisting others while doing Intuitive Oracle Readings. On to being rejected to get ordained. So why did I get rejected by one of the Institutes I had studied successfully with in the past and had been previously approved to do the ordination with? What vow caused me concern? I guess that will be the next post. I highly recommend Your Sacred Wealth Code Oracle Cards. I may have to get her book as well. Any purchases made through my links provides a nominal commission, for which I am very grateful. LAST MINUTE INSPIRATION!!! AT LEAST THROUGH THE REST OF THE MONTH OF JUNE, 2018, LEAVE A COMMENT REQUESTING A SACRED WEALTH CODE ~ SINGLE CARD READING. I'LL COMMENT BACK WITH THE CARD I PULLED WHILE HOLDING YOUR NAME IN MY MIND. LET'S JUST TEST THIS BABY OUT!!! 💙🔥💙I absolutely adore your Sun & Moon Wedding Photo! Twin Flame Match Made in Heaven. Indeed. Your Love & Union is Bringing Heaven to Earth. So hit me with two oracle cards - one for me and one for Melissa, by email.